At Redbooth, we’re excited about Cisco Spark and its vision to transform collaboration and unified communications for the enterprise. With Spark, companies are able to use Cisco’s cloud infrastructure that’s scalable, accessible anywhere, and highly secure. We specialize in collaborative task and project management that lives in the cloud. And at Redbooth, we wanted to make it easy for Spark users to add an extra layer of productivity and task management to their Spark workflow. 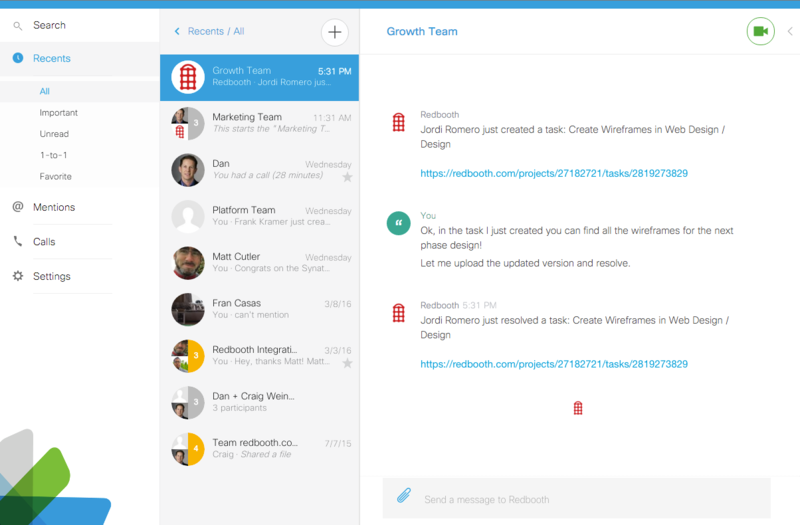 So we created an integration that connects your task-centric Redbooth workspace with your communications-centric Spark room. Essentially, with Redbooth, we make everything actionable, trackable, and reportable. With this new integration, you bring that level of accountability right into your conversations in Spark. To use the integration, you start with linking a Redbooth workspace with a specific Spark room, which takes just a few seconds. After that, when you create or resolve a task in Redbooth, an update automatically appears in the Spark room. That way, it’s simple for everyone involved in that project to stay up to date effortlessly on project progress — no key team members get left out of the loop. We’re thrilled to be one of the first third-party platforms to integrate with Spark — and we can’t recommend the experience highly enough. Spark’s API is great. It’s a very modern, standards-based powerful API that is developer-friendly, easy to integrate with, and follows the main HTTP REST plus OAuth 2 standards. We enjoyed using developer.ciscospark.com throughout the process of building the integration. Not only can you find all of the documentation for the API, but there’s another useful feature there as well. As a developer, you can go to their interactive console and just “pretend” you’re doing an API call and see how it works. This helps you understand it better, and then you can go ahead and copy the same behavior in your code. It’s very helpful. We also got first-hand support from the Cisco Spark product and API team. They helped us shape the integration so that it’s most valuable for our shared customers and adds value in a convenient, streamlined, and user-friendly way. Additionally, we were glad to help pave the way for developers who will be integrating with Spark in the future. When we built the Redbooth integration, the API didn’t yet have a Ruby wrapper for their authentication layer. We built it ourselves, and it’s accessible in Github. Check it out and let us know what you think! Jordi is Redbooth's VP of Business Development & Platform. He originally joined Redbooth at the very beginning, serving as CTO and growing the team from 3 to 20+. He also cofounded and served as CEO of itnig, an internet startup accelerator in Barcelona, and ran a small software development consulting company.